Legacy backup software is failing for enterprise NAS under the growing demands of massive unstructured data, but digital assets are more critical than ever to business success in this data-driven age. To keep up with this digital transformation, businesses need to modernize their data management infrastructure. Igneous delivers a streamlined secondary storage solution built to handle billions of files and petabytes of data and designed to protect your digital assets as they grow. - Ease of management: Igneous takes care of maintenance, troubleshooting, and software updates. - Scalability: Our scale-out solution effortlessly handles your growing data and eliminates silos. - Agility: Automatic, non-disruptive updates (NDU) and user-friendly search and retrieval increase business agility. Igneous Systems designed the industry's first backup and archive solution for massive unstructured data in a hybrid world. 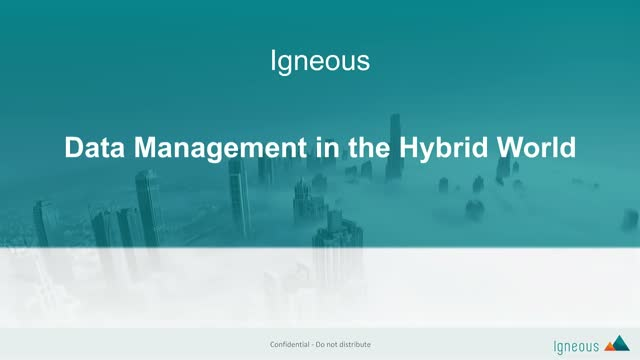 Igneous Hybrid Storage Cloud streamlines data management functions, including data protection, movement, learning, and search and discovery, for enterprises with billions of files on network-attached storage. Our hybrid solutions offer the scalability, resiliency, and agility of cloud coupled with the ability to seamlessly move files across multiple tiers of storage—all delivered as-a-Service with remote monitoring and non-disruptive updates. Based in Seattle, Igneous holds 13 patents in the United States. Gartner recognizes Igneous as a "Cool Vendor in Storage Technologies" in 2017.